Hudson Yards, an exclusive new neighborhood primed to open on Manhattan's West Side in March, could be the future home of a spacious Apple office and accompanying retail outlet, according to a report late Monday. Citing sources familiar with the matter, the New York Post reports Apple is in advanced negotiations to lease a 60,000-square-foot office space at 55 Hudson Yards, one of three commercial towers that overlook the expansive Hudson Yards redevelopment. Additional information about the potential lease was not made available, though the 780-foot tall tower will be home to financial services company MarketAxess and law firms Milbank and Boies, and Schiller & Flexner, LLP, according to the Hudson Yards website. 55 Hudson Yards joins the 30 Hudson Yards and 10 Hudson Yards skyscrapers, the former of which will be New York's second-tallest building when construction is completed in the coming months. The Post also claims Apple is in discussions with site co-developer Related Companies to open a retail presence in the 28-acre multi-use complex. Specifics were left unmentioned, but the mega-project includes a large high-end shopping center called The Shops at Hudson Yards, which will boast more than 100 shops anchored by New York's only Neiman Marcus. 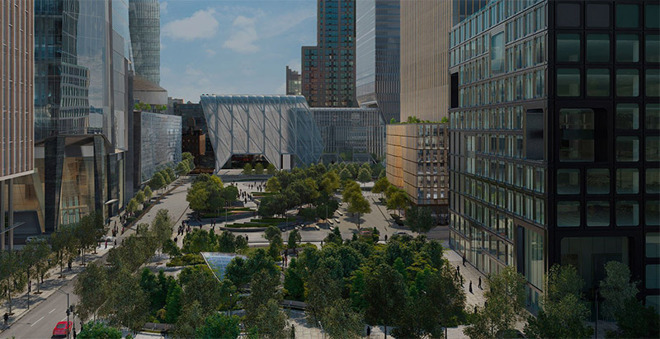 Current plans call for a grand opening for Hudson Yards residences, a public square and garden space in March, while a center for the arts called The Shed is scheduled to open in April. Other residential and commercial towers will open as they are completed in the ensuing months. A Hudson Yards Apple Store would be the company's eighth retail outlet in Manhattan.